The Great Ocean Road icon. The top attraction on the Great Ocean Road is easily the Twelve Apostles, located three hours to the southwest of Melbourne. The non-human form of the Twelve Apostles is a collection of limestone stacks along a glorious stretch of coast that features sheer cliffs and a series of beaches. Formerly known as the ‘Sow and Piglets’, the Twelve Apostles today are actually eight in number; the others have already succumbed to the elements. Nevertheless, it is a fabulous sight to behold from one of the viewpoints within Port Campbell National Park. As with other places in the world where these types of stacks are formed, wind and water wear the coast over millions of years until weaknesses cause the collapse of the bridge that is left connecting the mainland. And it has taken around 20 million years to get where we are now with the group of Apostles, some of which are over 40m high. They are beautiful when viewed any time of day, but especially at dawn or dusk, as well as when the sun is beating down and the tide is partially out to reveal the sand. Access is from the Twelve Apostles Centre, which is at the eastern end of the sight and connected to the lookout platforms via a short track and tunnel. You can learn about the heritage of the stacks and there are also toilets here, while just behind the centre is the 12 Apostles Helicopters for flights over the coast. It’s very informal and you can simply walk across from the visitor centre. Alternatives in the area to get to the beach are the staircases at Loch Ard Gorge and the Gibson Steps. The nearest main town is Port Campbell, a few minutes’ drive from the west. It has several good hotels, along with entertainment and a cute beach of its own. 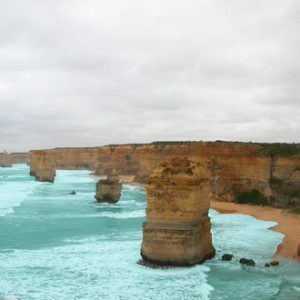 From Melbourne, the drive is about three hours along Princes Highway, or four hours along the scenic Great Ocean Road.